Small-scale table lamp with a wrapped hand-blown glass shade. 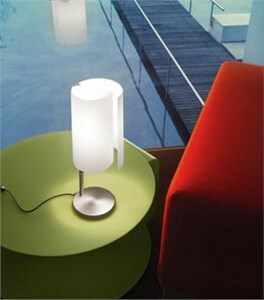 Diffused ambient illumination is provided by this lamp with an incandescent light source. Companion table, wall and floor versions also available. A hand-blown shade is supported by a brushed nickel base. An on/off switch is provided on the black cord. 1 x 60 watts, incandescent, A-19. Base and support details: Brushed Nickel.